Have you been looking for a reliable and trusted fitness tracker that you can count on when it comes to helping you keep track on your health and fitness!? Finding an accurate and reliable fitness tracker is nearly impossible, especially when everything else is advertised as such. The ETCBUYS MAG200-PRO smartwatch is that solution! The color OLED display smartwatch monitors heart rate, blood pressure, blood oxygen, and sleeping patterns accurately. Not only that, it also functions as locator for lost phones, has a camera and social media enabled functions. That's not all! It also works as a pedometer counter, stop watch, shows your text messages, and call notifications. So not only will it help you keep healthy and fit, it will also integrate your life schedules on top of each other harmoniously so you wouldn't feel like working out or keeping yourself healthy is such a burden. Our smartwatch has proprietary easy to use features that makes it untimidating to use even for older fitness buffs. Its OLED color display makes it very easy for anyone to monitor their health statistics even under the bright light of the sun. This product is specifically designed to deliver, with the thought of promoting good cardiovascular health. This means that not only will you be able to monitor your heart beat per minute, or your blood pressure to make sure your organs are working properly, or that you're well away from any future attacks, it also puts you in control knowing that you're as healthy as you can be! The ETCBUYS MAG200-PRO features everything you need to start a healthier and fitter lifestyle. It's easy to see why customers love it when it delivers everything it promised, such as accurate health statistics, easier integration with smartphones, non-intimidating features, and super savvy style. Don't forget about our 100% Satisfaction Guarantee! ★ MULTI-FUNCTION THAT TRACKS YOUR VITALS: The MAG200-PRO exercise watch efficiently monitors heart rate, blood pressure, blood oxygen and sleeping patterns making it easier for you to schedule a healthier workout plan. It also has a sedentary and hydration level reminder to really make sure you are healthy and fit anytime, anywhere. Other than those features, the MAG200-PRO can find lost phones, and has a camera and social media functions. ★ BRIGHTEST OLED COLOR SCREEN DISPLAY: Helps you monitor your heart rate, blood pressure, blood oxygen, and sleeping pattern outdoors. A user friendly smart band that has colored screen for easy and convenient reading even the darkness of the night. The OLED screen technology produces brighter lights with the use of less energy. This means that the MAG200-PRO fitness tracker is also battery-efficient. 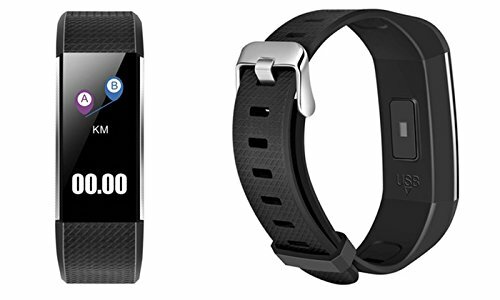 ★ EASY TO USE NON-INTIMIDATING SETUP: The MAG200-PRO wearable fitness smartwatch has proprietary easy to use features that make it very easy for you to operate. Unlike other smartwatch brands in the market, this particular fitness tracker can easily be integrated to your smartphones without any intimidating complications. Its ideal for young and old fitness buffs and those who are starting to establish a healthy lifestyle. ★SLEEK STYLISH DESIGN: The MAG200-PRO was designed to be both appealing to men and women. It's lightweight and has an 80 x 160 resolution so monitoring your health statistics can easily be read. It is dust proof and touch screen,has large writing on the display screen. ★ WHY ETCBUYS? Backed by our CUSTOMER SATISFACTION GUARANTEE. This fitness tracker has everything you need to be healthy and fit allowing you to keep track of your work or life schedules all in a size of a watch. It delivers accurate results, super easy to use, and stylish too. But if for whatever reason you are not 100% satisfied we'll take back your product, no questions asked. With ETCBUYS you can be confident that your satisfaction is always our top priority.